With this dress, the fabric definitely came first. Usually I have an idea in my mind about the kind of dress I want to make, and then go in search for the right fabric. But this time, as soon as Caroline from Blackbird Fabrics posted about this fabric in an Instagram video, I knew that I had to have it! As soon as it was for sale, I bought 3m of the stuff so that I could make a dress for a few events that I had coming up (that actually took place in September/October - I am very late blogging about this one). It is no longer available which I think is testament to it's gorgeousness! 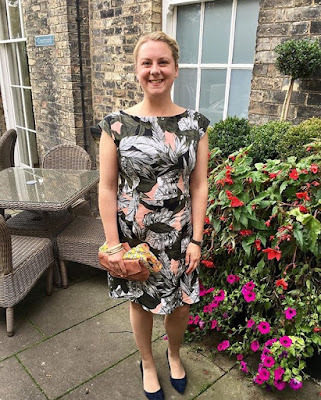 I decided to buy the Anna dress from By Hand London as I really like the bodice of the pattern and thought that it would work well with the structure of this fabric. It is a cotton sateen so it's soft but sturdy. I decided to use the Charlotte skirt pattern, also from By Hand London, as I already had it and really liked how the combo had turned out for other sewcialists (notably here and here). The original skirt for the Anna dress is quite flared, so I did not think that it would work that well with this thicker fabric. I made a muslin in size 14 and was pretty pleased with the fit. I think that the key to getting the fit right on the Anna dress is to get the waist right, as this is the tightest part. I think that the bust looks nice with a bit of room so I didn't mind it being a bit larger here. To mirror the top, I decided not to make the skirt super fitted. The darts on the top and bottom line up quite nicely which is handy. I did trim a good few inches off the sleeves, but the dress still has the kimono like look that is part of the appeal of the pattern. If I make the dress again, I think I will go down a half or whole size for a more fitted look, but it really depends on the fabric. I was tempted to line the dress, but I think that the fabric is thick enough to hold it's own. 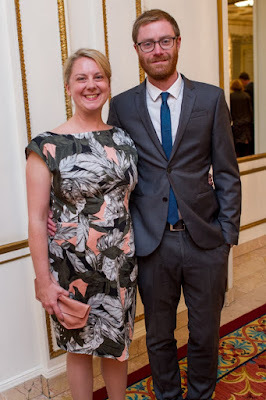 I wore this dress to an 80th Anniversary gala that I organized for my work, as well as two wonderful weddings that we went to back in England in October. We had an amazing almost three week visit to see our friends and family. We spent some lovely days with our family, and got to explore a new area to us, Sunderland, as my parents live there now. There are some glorious views in the Northeast of England. It was such a wonderful trip that I'm finding it hard to recover, especially as it has rained every day since we got back to Vancouver.